Spend the 13th (Tue) exploring nature at Kutini-Payamu (Iron Range) National Park. To find other places to visit, reviews, maps, and other tourist information, read Lockhart road trip app . Perth to Lockhart is an approximately 15-hour flight. You can also drive. The time zone difference when traveling from Perth to Lockhart is 2 hours. On the 17th (Sat), you'll travel to Seisia. Get outdoors at Fishing Charters & Tours and Jardine River National Park. Take the guesswork out of planning a Seisia vacation by using our trip itinerary maker. The Route module can help you plan travel from Lockhart to Seisia. On the 23rd (Fri), you'll travel to Marble Bar. Marble Bar is a town and rock formation in the Pilbara region of north-western Western Australia. Get a sense of the local culture at Comet Mine and Marble Bar Museum. There's more to do: appreciate the views at Carawine Gorge. For traveler tips, reviews, ratings, and tourist information, you can read our Marble Bar day trip planning site . The Route module can help you plan travel from Seisia to Marble Bar. The time zone difference moving from Australian Eastern Standard Time (Queensland) to Australian Western Standard Time is minus 2 hours. You will leave for Karijini National Park on the 29th (Thu). Take a break from the city and head to Dales Gorge and Hancock Gorge. Change things up with a short trip to Mount Nameless in Tom Price (about 1h 05 min away). To see ratings, other places to visit, and tourist information, refer to the Karijini National Park road trip planning app . Traveling by car from Marble Bar to Karijini National Park takes 6.5 hours. In August, daytime highs in Karijini National Park are 32°C, while nighttime lows are 14°C. Wrap up your sightseeing on the 4th (Wed) early enough to travel to Karratha. Karratha is a city in the Pilbara region of Western Australia, adjoining the port of Dampier. Take a break from the city and head to Murujuga National Park and Yaburara Heritage Trail. Satisfy your inner culture vulture at Cossack and North West Shelf Visitor Centre. Change things up with a short trip to Dampier Port in Dampier (about 36 minutes away). Spend the 9th (Mon) exploring nature at Millstream-Chichester National Park. 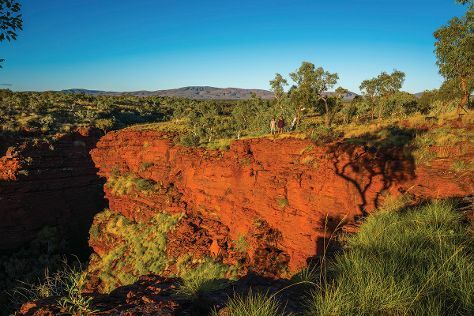 The adventure continues: get great views at Staircase To The Moon, see a world frozen in time at Cossack Heritage Trail, get lost in a book at Karratha Public Library, and don't miss a visit to Deep Gorge. Plan a Karratha trip in moments using our itinerary builder. You can drive from Karijini National Park to Karratha in 6 hours. You will leave for Port Hedland on the 10th (Tue). Port Hedland is the second largest town in the Pilbara region of Western Australia, with an estimated urban population of 15,191, including the satellite town of South Hedland, 18 km away. You'll get in some beach time at Pretty Pool and Spoil Bank. Get some cultural insight at Port Hedland Courthouse Gallery and Don Rhodes Mining Museum. Next up on the itinerary: look for all kinds of wild species at Cape Keraudren Nature Reserve, make a trip to Cooke Point Viewing Platform, take in panoramic vistas at Redbank Bridge Lookout, and see the interesting displays at Dalgety House Museum. To find ratings, maps, more things to do, and tourist information, read Port Hedland travel planning app . Getting from Karratha to Port Hedland by car takes about 3 hours. In September in Port Hedland, expect temperatures between 39°C during the day and 19°C at night. On the 15th (Sun), you'll travel back home.